If Kitty doesn't like Catnip, then give Cat Thyme a try. The first Cat Thyme plants we grew had to be caged to give them a chance against the wild cats. Once established they held their own. Cats don't usually eat Cat Thyme, but they do love to roll around in it and then take a nap! Check out our article on Prize Pets for other plants your kitty will love. Cat Thyme blooms with a fury and needs a good haircut when it is finished. This mound is about 10 inches high. It hadn't been cut back in a few years so it looks rougher than it would had it been trimmed each year. In a few weeks it will be covered with lush new growth. 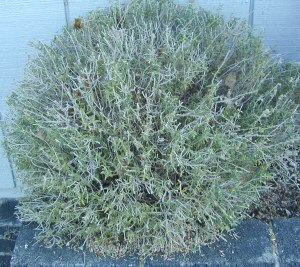 Cat Thyme like many members of the Teucrium genus makes a great hedge or edging for the front of a border. 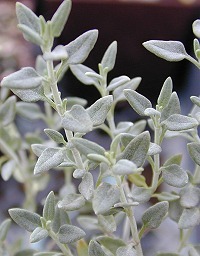 It is easy to see why the common name thyme has been applied to this plant. Each of these gray little leaves is actually covered in hairs which provide shade for this plant and help it to survive hot, arid summers. 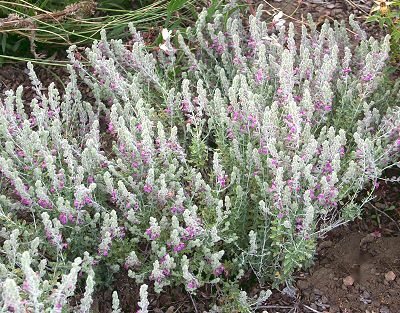 Like Teucrium chamaedrys (Germander), the profuse bloom of Cat Thyme attracts bees. Bees as we all know are necessary for pollination of veggies and fruits and other plants you might want to save the seeds of. This plant is often available in plug trays. These trays hold 128 of all the same plant. They are a great low cost way to fill a lot of space. Each cell is 3/4 of inch by an inch. Check here to see if Cat Thyme Plug Trays are available.